Rez Infinite, one of the first virtual reality games for Sony’s new PlaystationVR, this week earned praise from early reviewers for its graphics and immersing qualities. Sony announced the game — an update of a remake — last year. 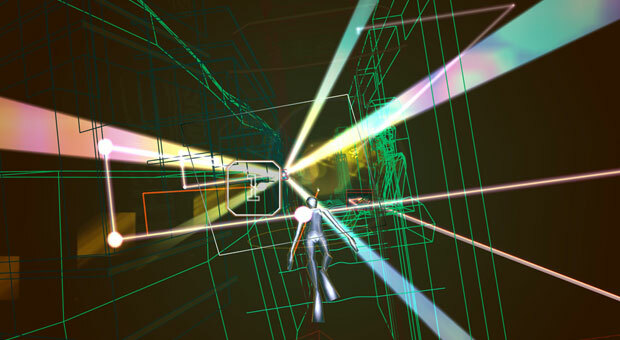 Featuring support for 1080p resolution graphics, along with 3D audio sound, Rez Infinite is designed for the PSVR, but it’s also compatible with the regular PlayStation 4. Instead of traditional gaming sound effects, Rez incorporates electronic music, which results in the audio being as important as the visuals. A high-definition version, Rez HD, became available for the Xbox Live Arcade in 2008. The latest iteration remains true to the original rail shooter music video game in many ways, but the Rez Infinite visuals and audio now are even more immersing through VR technology. Rez Infinite arrived at retail outlets in the United States on Thursday. The early take on Rez Infinite emphasizes the way it pays homage to the original while showing off the capabilities of VR. This game might have been just the right choice to show off Sony’s PSVR technology, because it is a blend of the familiar with something new. In addition, because the game is set in “cyberspace” rather than a more photorealistic environment, it makes a solid leap to VR. The jump from the pre-high definition era graphics of the Dreamcast and PS2 to a true VR experience is highlighted in the reviews. “I’m jealous of anyone who’s first experience of Rez is this virtual reality version,” wrote Matt Martin for VG247.com. “I wouldn’t say that Rez is the killer app for PSVR, in itself,” said Steve Bailey, senior analyst for games at IHS Markit. “Admittedly, for a number of people from my particular generation, who played Rez on the Dreamcast or PS2, it’s rather intoxicating to see the game realized for VR,” he told TechNewsWorld. However, “Rez was always a niche darling that never found wide acceptance, and I don’t think that its role is going to scale to a broader audience where VR is concerned, either,” Bailey added. “It is a very good example of what VR brings to the table,” said Lewis Ward, research director for gaming and VR/AR at IDC. “Yet when we look back in a year, this isn’t likely going to be one of the top-grossing games for 2016,” he told TechNewsWorld. What Rez Infinite does bring to the table is a rather simple — and again, familiar — experience that could help get those early adopters to embrace the new gaming techniques that VR offers. “It has a fast tutorial that gives you the basics clearly and then gets you into the experience quickly. It is easy to play, and can be enjoyed in short bursts or even somewhat extended sessions,” Ward pointed out. “On balance, Rez Infinite does have the feature chops to draw attention to the PSVR,” suggested George T. Chronis, game industry analyst at DFC Intelligence. “A major plus for the game is that it does not seem to induce nausea like so many PSVR titles as all are system limited to 60fps,” he told TechNewsWorld. There always needs to be a first to get the attention of early adopters and expand the base, and Rez Infinite is part of Sony’s strategy to do just that. “At this early stage, it is difficult to see any one title being sufficient to create significant VR hardware sales — the costs of adoption are still way too high,” said Chronis. “On the other hand, for those consumers already inclined to purchase a PSVR setup, Rez Infinite is the kind of solid title that can seal the deal,” he added. Sony isn’t hedging its bets on one game however. “The launch range of PSVR and PSVR-compatible PS4 games is a solid and interesting collection that will keep new owners entertained in the short term,” noted IHS Markit’s Bailey. “The challenge for PSVR will be to retain the attention of owners into the new year and beyond, with titles that offer fresh engagement — except accompanied by greater longevity and depth.